Whenever you find an injured or orphaned wild animal, call WildCare (415-456-SAVE (7283)) or your local wildlife hospital to determine whether the animal needs help! These handy flowcharts will help you determine whether to intervene. Click for the Found a Baby Mammal flowchart. Click for the Found a Baby Bird flowchart. Touching a baby animal will NOT cause its parents to reject it. This is a myth! Some young animals may not need rescuing– please call first to determine if an animal needs to be rescued. Please don’t “kidnap” a healthy animal! Operators are available from 9am to 5pm, 365 days a year. After 5pm PST (Pacific Standard Time), for wildlife emergencies only, call our Wildlife Emergency Nightline at 415-300-6359. See temporary care instructions for all animals below. Then, bring the animal to WildCare (or your local wildlife hospital) when we open at 9:00am. Click for directions to WildCare. 3. If NOT in Marin County, click to find a wildlife hospital or Humane Society near you. *If you live in Marin County, California and are uncomfortable picking up (with gloves) or otherwise capturing an animal, please call the Marin Humane Society for assistance at 415-883-4621. They will help transport the animal to WildCare. If you are outside Marin County, please contact your local Humane Society or animal control agency (click for a list of local animal services organizations.) Many Humane Societies and animal control agencies are contracted with local wildlife centers to bring them injured wildlife. Most Humane Societies are not licensed to care for injured wild animals themselves. Call WildCare at 415-456-SAVE (7283) or 415-300-6359 (after 5pm) before approaching any animal. Do not give the animal any food or water. Feeding an animal an incorrect diet can result in injury or death. Also, a captured animal will get food and water stuck in its fur/feathers potentially leading to discomfort and hypothermia. Place the animal in an appropriately-sized, secure box with a towel or paper towel on the bottom. Make sure the box has holes in the lid. Follow the instructions given to you by the WildCare Hotline Operator. Keeping a native wild animal in the State of California is against the law if you do not have the proper permits and licenses, even if you plan to release the animal. Not in the Bay Area? Click here for a listing of wildlife rehabilitators in your area. Raising a wild animal from babyhood is a tremendously challenging process. For instance, raising a wild bird properly takes 2 to 4 months of intensive care. During this time, naked and pre-feathered nestlings must be fed every 20 to 30 minutes from dawn to dusk (roughly 14 hours) every day. Skipping any feedings or feeding the wrong diet during this critical period can result in irreversible deformities that may not be seen until the bird is a juvenile. Each animal species has specific caloric and natural diet needs and babies need to be taught how to recognize, find and eat these foods in order to survive in the wild. Once self-feeding, they also need weeks in a large, protected outdoor flight aviary or cage to build up muscles and skills that will allow them to compete in their natural environment. Wildlife rehabilitators are equipped with the proper licensing, have extensive knowledge of nutritional and dietary requirements, and have the facilities to properly raise wild patients. 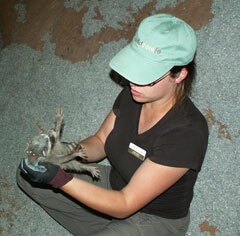 All ill, injured or orphaned wild animals must be brought to a licensed wildlife care center like WildCare. I found a baby songbird. What do I do? Click for a PDF chart to determine if the bird you’ve found is orphaned. Always call WildCare 415-456-SAVE (7283) before handling a baby bird. While parent birds will accept a baby back if it has been touched by humans, the stress on the bird can be detrimental. If a baby is naked (without feathers or with few feathers) the requirement for immediate action is much higher. Parent birds will continue to feed their babies after you have touched them. Most birds have a poor sense of smell and parent birds won’t know (or care!) that you have touched their baby. Baby birds can be returned to the nest! Parent birds will even be foster parents for an abandoned baby of the same species and age of their own young. Parent birds will search for their babies even after 24 to 48 hours of absence. Most birds have their own territories. Even if the nest and babies are gone, the parents remain in their home territory, waiting to welcome their babies home. Has the Bird Been Abandoned? Watch for the parents… observe the baby bird continuously for 60 to 90 minutes from a distance of 50 feet. Watch carefully; the parents will fly in and out quickly. Clear with white poop (or green bile) indicates a baby bird is not being fed, and is likely abandoned. Color in the poop indicates that the parents are feeding the baby, and the bird should be put back where it was found. Naked and pin-feathered birds should be kept warm while trying to locate their nest. The babies will get chilled quickly. An entire nest of birds can sometimes be placed in a small tissue-filled wicker basket or butter tub with drainage holes in the bottom. Call WildCare’s Hotline at 415-456-7283 for advice before attempting to renest. You may be instructed to hang the basket or tub to a tree in a location as close as possible to the original nest site, and in a spot safe from crows and hawks (with some tree-cover). Be sure that a branch shields the nestlings from sunburn. Not all situations are appropriate for renesting, however, and if the babies were injured in their fall they will need care. Always call WildCare first 415-456-7283. One single baby must be returned to the original nest with its siblings. Parent birds will only sit on and feed the babies in one nest. If the nestling cannot be returned, call WildCare at 415-456-7283. These birds have feathers and short tails and can perch, hop or walk. They are learning to fly, a process that may take two weeks. Fledglings should be left alone to practice hopping and fluttering from low shrub branches to the ground. The parents are close by, and continue to feed the babies until they learn to fly and eat on their own. Parents will guide the fledglings into the bushes at night to hide from predators. Keep pets and children indoors so the parents will return to their baby. If a bird can perch on your finger, place it in a bush near the area you found it. If you found the bird in a high-traffic area, move it to a safe area under the cover of bushes. Parents communicate with their young by a series of voice calls. As long as a fledgling is placed in its home territory, the parents will be able to locate it and move it to a safe location. At a distance, (indoors is best) watch continuously for one hour for the parents to return. If the parents don’t return, call WildCare immediately at 415-456-SAVE (7283). I found a Hummingbird. How can I help it? If you find an injured or orphaned hummingbird on the ground, lift it along with the material it is sitting on, and place it on crumpled tissue in a shoebox with holes in the lid. Always use tissue or paper towels, NOT cloth—the bird’s feet may become entangled in the cloth. Call WildCare immediately (415-456-SAVE (7283). Hummingbirds will die within four hours if not fed. Hummingbird babies that are fed sugarwater or commercial hummingbird nectar for more than 24 hours may develop crippling deformities. Never attempt to remove baby hummingbirds from their nest. Young hummingbirds secure themselves to the nest by weaving their tiny toes around the nest fabric. So firm is their hold, that if lifted from the nest, most often the legs are left behind. I found a baby jackrabbit. Is it orphaned? Jackrabbits are “precocial,” meaning they are born fully furred with their eyes open, and will start nibbling greens within a week. A baby jackrabbit is called a leveret. A leveret’s main defense when threatened is to freeze, which is often mistaken by people as being calm. The animal is not calm, it is terrified. The mother jackrabbit separates her litter for a better chance of some babies surviving. There is no nest! Jackrabbit young will stay hidden in the grass, shrubs, or other ground-level growth where the mother leaves them. The mother only comes to feed the young two or three times a day. Otherwise, the young jackrabbits are left alone. Even if you are watching carefully, you may not see the mother jackrabbit return to her young. Do not assume the babies are orphaned simply because you do not see the mother! Leverets will wander a bit. When the mother returns to the area, she calls to her young and they come to nurse. Never try to feed a leveret, they have very delicate digestive systems. Jackrabbits are extremely high-stress animals; they can die from fear. Jackrabbits have very strong hind limbs and if restrained may kick out hard enough to break their own backs. Always call WildCare at 415-456-7283 first to determine if a jackrabbit needs rescuing.